My husband and I live on 20 acres at Darwin River. 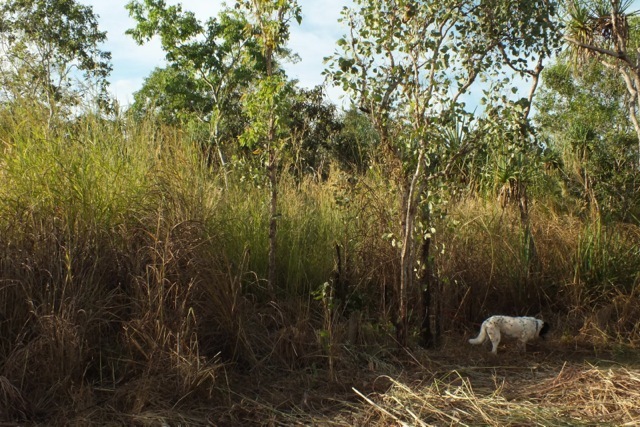 Our property is set amidst a sea of mission and gamba grass, although we have very little on our property because we work so hard to keep it out. I’ve been out this morning weeding. I’m out every morning. In fact, my husband and I spend between four to six hours a day, every day trying to manage the threat of weeds. I’ve a PhD, and Michael is an an accountant. We’d really prefer to be off doing other things! But there’s just no chance of us having other jobs and managing the weeds here effectively. 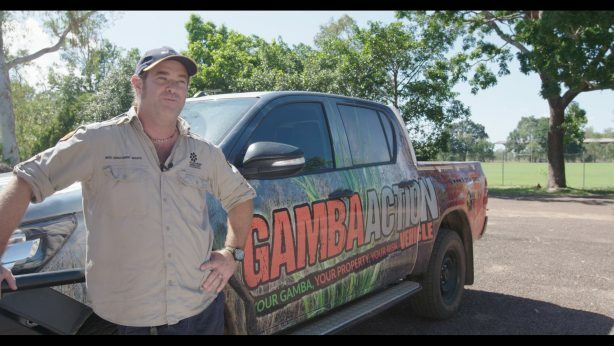 Michael managing gamba on their property. I think that’s a problem on a lot of other around blocks. Last year gamba and mission grass were hanging over our fence from one of our neighbours. 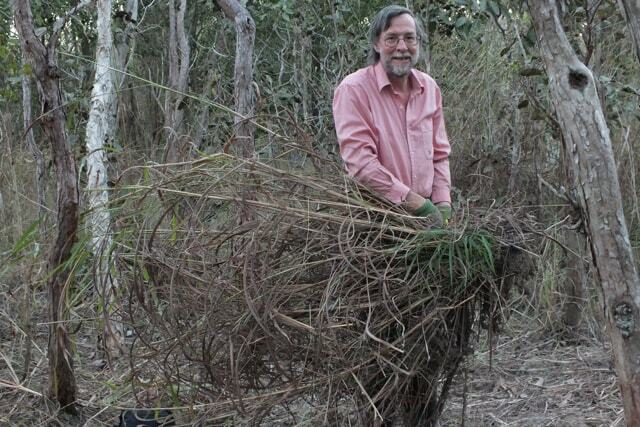 Landholders have a range of reasons for not managing their weeds. For example, people working in town just don’t have the time needed to manage the gamba on their properties alone. I’ve spoken to people who say the government and the cattle industry brought it in and so they should fix it. I have spoken to people who think it’s not their fault. 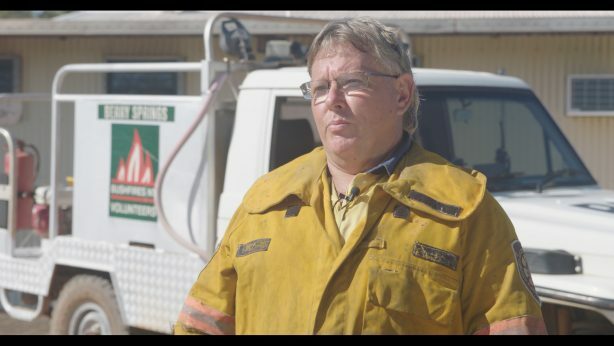 But gamba-fuelled fires are a threat to everyone – landholders, tourists, rangers, campers. In late June, 2017, a bad gamba-fuelled fire started east of us, and it took the firies a day to stop that conflagration (nice word, don’t you think!). They had two water bombers, two spotter helicopters, 12 firetrucks, a grader and a tanker and it took them a day! And things weren’t that dry because we’d had a heavy wet season. Last year visitors to Litchfield National Park were caught in a gamba-fuelled fire. They could have died. And a deliberately-lit fire near us could have claimed the lives of two people. I think some people will simply have to give up in the future. We don’t want to see that. Whoever’s at fault originally, we need to work together to get on top of the threat. I believe that working together we can. But we need a multi-faceted approach now, including an education campaign that grabs everyone. Everyone needs to be involved. Our property is an island, but how long can we keep that up? As things are, and the gamba and mission grass is even worse this year we expect to be burnt out at some stage. Denise and Michael’s property had a gamba infestation when they bought it. They’ve since brought it under control. Having controlled the gamba threat so far, the flora and fauna on our property is very diverse. We really hope to keep it that way.